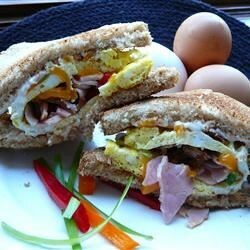 "This is a delicious, flavorful breakfast sandwich that will fill you up and get you ready to go in the morning. I like to use Tillamook Cheddar cheese. Add various chopped vegetables and meats such as sliced chicken, turkey, or roast beef to the egg mixture to suit your taste." I haven't tried the recipe yet. I'll give it 3 stars cuz it sounds yummy....except for the "1 cup salt and ground black pepper to taste (optional)". I'm hoping that's a typo!!! It says add a PINCH of salt and pepper. season to taste. use common sense.